A pilot scheme of cheaper ferry fares for all Western Isles routes to the mainland is to be extended for a further year. The Road Equivalent Tariff (RET) scheme has reduced ferry fares by up to half for all users and was introduced on routes in October 2008. Earlier this year, emerging evidence reported an increase in travel and local businesses are working with Highlands and Islands Enterprise to maximise the benefits of the scheme, which will now be extended until spring 2012. "The Scottish Government’s decision to extend the Road Equivalent Tariff pilot is welcome news for businesses and communities in the Outer Hebrides, Coll and Tiree. "This will allow the pilot to continue to operate while the Government carries out a detailed assessment of its economic impact. "We look forward to seeing the results of the assessment early next year." "We are certainly seeing more visitors, and particularly camper vans, which has had a significant effect on our sales in our shop. A recent expansion to our shop has allowed us to increase the range of goods and brands to our customers. Last year sales were up 25% since the introduction of RET and this year they are up another 10%. There is no doubt that RET has had a significant impact on visitor numbers to the islands coming from Britain and all over the continent." "We have experienced another busy summer in Harris. The season began early, with a busy Easter period at the start of April and this trend continued throughout May. June and July figures were both up on last year, and for these two months, room occupancy was at 99%. August seems to be continuing in the same fashion. “RET undoubtedly continues to benefits these islands and is often remarked upon by guests, both those visiting for the first time and those who paid the previously higher fares before the introduction of the scheme. It is very possible that if RET were not to continue, people would highlight a new higher-cost fare as a reason not to visit the Outer Hebrides, so the continuation of this scheme is vital to the future well-being of these islands." "The island has been snowed under with visitors. Every ferry sailing is the same - it has been very busy. RET has been a real success story in the islands and the area is booming. We moved into a new premises recently which is eight times bigger than our previous building. Although our business has been quieter in Stornoway, our shop in Back has been snowed under with tourists." "Taigh Chearsaibhaigh is positioned next to the ferry terminal which is a bonus and no doubt helps to attract the additional visitors. There was a big jump in numbers of visitors in June. Takings are up at the museum, café and shop. The numbers for July are saturated - we can't get any more people on to the boats. If it wasn't for RET, things would be very different. There are a lot of caravanettes and caravans in the islands. Many other businesses in the Uists are seeing a big jump in their takings. RET has given us a lifeline here in the Uists." RET involves setting ferry fares on the basis of the cost of travelling an equivalent tariff by road. The relevant routes are Ullapool – Stornoway, Uig to Tarbert (Harris)/Lochmaddy (North Uist) and Oban – Castlebay (Barra), Lochboisdale (South Uist) and Oban to Coll and Tiree. Banff & Buchan MSP Stewart Stevenson has called on opposition parties to put party politics aside and support the Scottish Government’s Alcohol Bill as new figures from the Scottish Health Survey today show the scale of the problem. The survey found that mean daily alcohol consumption amongst men in Scotland was 6.2 units compared to 4.3 units in England, while mean daily consumption amongst women in Scotland was 3.5 units compared to 2.2 in England. The recommended daily limits are 3-4 units for men (21 units per week) and 2-3 units for women (14 units per week), but these figures show the average weekly intake in Scotland to be 43 units for men and 24 units for women. “The problem revealed by these statistics is deeply alarming, with people in Scotland drinking significantly more than people in other parts of the UK and well above their safe recommended limits. On average men are drinking more than double the recommended limit in a week while women are not far behind. “Clearly something needs to be done to address this problem and the knock-on damage it does to society. Alcohol related issues in health and policing cost the Scottish economy £3.65 billion every year, but the emotional cost to families whose loved ones suffer ill-health as a result of alcohol is incalculable. “We need bold action to tackle Scotland’s relationship with alcohol and it is inexcusable for other parties to continue to play partisan politics with the lives of people in Scotland. The range of measures in the Alcohol (Scotland) Bill have won support from the police, health professionals and even some alcohol producers, amongst others and it is time for everyone in the Scottish Parliament to come together and support the Scottish Government’s efforts. Updated advice that focuses on ensuring communities can effectively engage in the planning system has been published today by the Scottish Government. The document encourages engagement with communities from the earliest possible stage to enable views to be reflected in development plans and on individual proposals. Delays for communities and developers alike will then be less likely. "We recognise both the important role planning plays in building strong and sustainable economic growth in Scotland and the interest of communities in development plans and proposals. "We want to ensure that planning authorities and developers are clear on the need to engage with communities when policies are developed, and when planning proposals are being brought forward. We believe increased public engagement can produce more satisfactory outcomes and help avoid delays in the planning system. "Publication of the document builds on our wider ongoing work with planning authorities, agencies and the private sector to deliver a modern, efficient and fit for purpose planning system. "Initiatives such as the Scottish Government's National Planning Framework, which identifies the key strategic infrastructure Scotland needs, and the introduction of consolidated, easier-to-understand planning policy, are geared towards simplifying the process. "With increased collaboration across the public sector, and better public engagement, we can ensure planning makes the fullest possible contribution to economic development, providing developers and communities alike with more certainty. "And we will shortly be publishing a report on the Charette series held earlier this year. The Charrettes are a truly innovative and exciting approach to empowering communities that the Scottish Government is pioneering on a national scale. They allow people to positively shape the decision-making process in their communities in a dynamic and effective way, improving the quality, attractiveness and success of places across Scotland." Scottish Government policy on community engagement in the planning system is contained in Scottish Planning Policy (SPP) which was published in February 2010. SPP recognises that effective engagement with the public can lead to better plans, better decisions and more satisfactory outcomes and can help to avoid delays in the planning process. It also improves confidence in the fairness of the planning system. The Scottish Sustainable Communities Initiative (SSCI) Charrette Series took place throughout March 2010 and involved an innovative and interactive approach to public engagement in order to develop community-informed masterplans. The Charrette series involved three of the exemplar projects selected by the SSCI at Lochgelly in Fife, Ladyfield in Dumfries and Grandhome on the edge of Aberdeen. Banff & Buchan MSP Stewart Stevenson paid a visit to the Wizard Music Festival at New Deer to meet with Red Cross emergency response and first aid volunteers. Mr Stevenson was invited by the Red Cross to visit their volunteers 'on site' and see at first hand how they handle major public events. The Red Cross provided first aid cover at the Wizard Festival and their operation there involved around 25 volunteers and some staff. The Red Cross covered the event throughout the weekend and was on hand to support the emergency services should an emergency have arisen. "I was very pleased to accept the invitation from the Red Cross to pay them a visit whilst on 'active service'. "Red Cross first aid volunteers are highly trained individuals that are well equipped to deal with any type of emergency that members of the public may face and are there to ensure there is a smooth running of the event that everyone can enjoy. "Many of us take for granted our safety at outdoor public events, but ill-health can strike at any time and medical emergencies can and do arise. 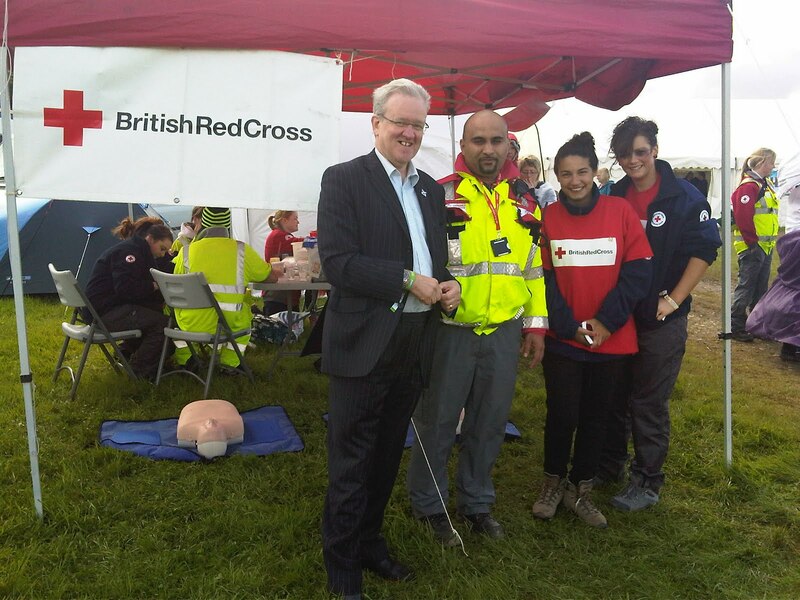 When they do, it is very reassuring to know that expert help is at hand and I pay tribute to the men and women of the Red Cross who give up their time at these events to ensure that others can have a safe and enjoyable visit." Following on from reports today (Friday) of a ‘major’ discovery of oil in the North Sea, Banff & Buchan MSP Stewart Stevenson has renewed calls for a Scottish Oil Fund to be established. Nobel Prize winner and former Chief Economist of the World Bank Prof. Josef Stiglitz, said on BBC Scotland’s Newsnight programme on Tuesday (24th August) that the UK had “squandered" it's oil wealth and that it is now "imperative" an oil fund is established to secure the wealth that remains under the North Sea for future generations. “The oil industry has contributed a great deal to Scotland, especially in the North-east, and it’s showing no sign of drying up despite the pessimistic view taken by the London Parties in the 70’s, which still continues today. Network Rail completed track laying on the new 24km stretch of railway between Airdrie and Bathgate today (Friday 27 August), making it the longest domestic passenger railway with new stations to be built in Britain for a century. A 200-tonne mobile track laying machine ran through the site of the relocated Drumgelloch station over the course of two hours, completing a modern, soon-to-be electrified rail link between West Lothian and North Lanarkshire. By December 2010, the line will carry four trains an hour in each direction, opening up travel options between Scotland’s two biggest cities. "Scotland has the most ambitious climate change legislation anywhere in the world and our climate change delivery plan means persuading motorists to get out of their cars and use more sustainable forms of transport. That's why we are investing £300 million in the Airdrie - Bathgate route to bring considerable benefits for the communities along the route, forming a direct rail link to Glasgow and Edinburgh for towns like Caldercruix, Blackridge and Armadale for the first time in 50 years. "I am delighted that we have reached this significant milestone - a clear indicator that this work is moving apace towards final delivery. Once complete this new route will offer travellers a real alternative to the car and enable people to make better use of public transport networks." At 24km (15 miles), the Airdrie-Bathgate is the longest domestic passenger railway to include new stations to be built in Britain since the Ashendon to Aynho line was constructed through Bicester North, Oxfordshire in 1910. In Scotland, it is the longest line to be built since the Ballachulish branch line opened in 1903. The £300m Airdrie-Bathgate Rail Link is funded by Transport Scotland. Transport Minister, Stewart Stevenson, today announced early design work for a major upgrade to one of the north of Scotland’s most important roads is under way. The work will identify the preferred solutions for dualling the A96 between Inverness and Nairn, a new link connecting the A96 to the A9 south of Inverness and an A96 Nairn bypass. “I’m delighted to announce the go ahead for this work which further underlines our commitment to upgrading the A96. “The study, which forms part of our commitment through the Strategic Transport Projects Review to upgrade this section of the A96, will identify solutions in taking the schemes forward - schemes which will help improve journey times in and around the east of Inverness and along the whole route, and provide benefits to local communities and businesses by better connecting them to economic centres. The upgrade will also improve access for passengers to Inverness Airport and other future growth areas on the A96 corridor. It is exactly this type of investment in transport infrastructure projects which is protecting economic recovery and building sustainable economic growth. In taking forward the necessary, detailed preparatory work, the Scottish Government has been working with partners at The Highland Council to ensure proposals support their work on the Highland Wide Development Plan which will see significant growth along the A96 in the coming years. The £500k contract has been awarded to Jacobs Engineering UK Ltd, and findings from this work are expected in Spring 2011. Scottish organisations could save over £250 million a year through reduced fuel bills by switching to greener company cars. Following the success of last years event, GreenFleet Scotland is coming to Edinburgh on Thursday 2nd September 2010 to show businesses how they can reduce fleet costs. This free event will showcase a range of green vehicles and technology, the extent of which has never been seen previously in Scotland. Organised in conjunction with the Energy Saving Trust with funding from the Scottish Government, this is a ‘must attend’ event for fleet managers and those responsible for vehicle procurement. This year’s free event at the Royal Highland Showground will see a range of seminars, where the latest fleet issues can be discussed. Focusing on the most current fleet topics, attendees will be able to hear about the latest developments and share their experience and knowledge of the issues of the day. Attendees can also compete in an eco-driving experience, with teams navigating their way to a number of checkpoints in the Edinburgh area in order to test their eco-driving skills. “GreenFleet Scotland is a great opportunity for organisations in Scotland to find out about the latest in low emission vehicles. Low carbon or no-carbon vehicles have a significant role to play in helping Scotland reach its carbon dioxide reduction target of 42 per cent by 2020. Register to come along to this free event at www.greenfleetscotland.co.uk. To find out more about how a green fleet review could benefit your company and for advice on sustainable travel planning, visit www.energysavingtrust.org.uk/businesstransport or call 0131 555 7874. Islanders on Raasay, off Skye, were today (Tuesday) celebrating the opening of their £12 million new ferry terminal. Stewart Stevenson, Minister for Transport Infrastructure and Climate Change, was joined by pupils from Raasay Primary School in unveiling a plaque to mark the completion of the terminal at Churchton Bay, which provides a sheltered roll on roll off facility for the Caledonian MacBrayne car ferry, Loch Striven, and overnight berthage. Built by Balfour Beatty, the new terminal has an all states of the tide slipway, a 150 metre long ferry berth, and 40 metre dog leg to provide the necessary shelter. It is 2.5 kilometres from the former terminal at Suisnish, which was constructed at the beginning of the 20th century for the transportation of iron ore from Raasay. In the early 1970s Suisnish was enhanced to provide a slipway and berthing structure for the introduction of a new Island Class ferry direct to Sconser rather than Portree. Suisnish pier has now reached the end of its life, and is in a very poor state of repair suffering from both corrosion of the precast concrete sections and accelerated low water corrosion of the sheet piles and does not provide the shelter that a modern day roll on/roll off ferry service requires. Climate Change Minister Stewart Stevenson MSP received a warm welcome from Dunbar environmentalists when he visited the town. Mr Stevenson, who was finding out more about the work of local charity and development trust Sustaining Dunbar, spent more than an hour with staff and board members. Staff were able to brief the minister about three projects supported by the Scottish Government’s Climate Challenge Fund. These were the Connecting Dunbar sustainable travel project; the energy audit service in conjunction with the BeGreen home energy advice shop; and the 2025 Energy Descent Action Planning project. “Sustaining Dunbar is a marvellous example of creative local action to move to a low-carbon community. “I’ve seen how Sustaining Dunbar is building many productive local relationships in pursuit of reducing emissions in areas such as food, transport and energy. The minister’s visit preceded the opening on Monday of a two-week exhibition about the ‘2025 vision’ and action plan for a low-carbon, locally resilient future in Dunbar Library. The action plan builds on local survey findings in which more than 1,500 residents in the Dunbar area were interviewed. The public is encouraged to visit the exhibition and add their further comments and ideas. They can also take advantage of the new book collection which Sustaining Dunbar has donated to the library. This includes titles on climate change and ‘peak oil’, as well as ones on some of the practical skills which are likely to be needed in the future. Carillion will begin work on the electrification of Edinburgh’s Haymarket north tunnel in September in what will be the first physical element of the Edinburgh-Glasgow Improvements Programme (EGIP) to be delivered. Amey Infrastructure, Atkins and Delta Rail have also been awarded separate design and development contracts for other EGIP projects. EGIP which is being funded by Transport Scotland on behalf of the Scottish Government, will make significant investment in the rail infrastructure linking Scotland’s two main cities, and the surrounding towns, enabling increased service levels and reduced journey times. With the new infrastructure financed through Network Rail’s Regulatory Asset Base, EGIP is expected to deliver a range of benefits by 2016 including a fastest journey time of 37 minutes on the main Edinburgh Waverley-Glasgow Queen Street route and increased service levels on all routes between the two cities from the current five or six services per hour to 13 services per hour. In the short-term, the electrification of the north lines between Princes St Gardens and Haymarket, via the Haymarket north tunnel, will improve reliability and increase capacity into Edinburgh Waverley ahead of the introduction of the new, four trains an hour, Airdrie-Bathgate route in December 2010. The £6m works at Haymarket north will involve track alignment and tunnel wall repairs to provide the correct clearances for the installation of overhead power lines through the tunnel. The project will commence in September and continue until December of this year. Ron McAulay, Network Rail director Scotland, said: “The awarding of these contacts is a significant step forward in the delivery of this ambitious and far reaching programme of enhancements. Transport Minister Stewart Stevenson added: “The Edinburgh-Glasgow Improvements Programme will revolutionise the rail network in central Scotland bringing real and lasting benefits to rail passengers. The award of these substantial contracts will also help Scotland’s hard-pressed construction sector through these challenging times, supporting jobs and helping accelerate economic recovery. With just over one year to go to the opening of Scotland’s first National Project, Stewart Stevenson, minister for transport, infrastructure and climate change took the opportunity to visit the new Port of Loch Ryan for a progress report. Stevenson met with senior officials from ferry company Stena Line for a briefing. The company are investing £200m in a new 28 acre site, two miles north of Cairnryan. The new facility will accommodate a port and terminal as well as new tonnage for the route to Northern Ireland, which is firmly on schedule to open in autumn 2011. The new port facility will provide a significant number of economic and infrastructure benefits as part of the UK’s third largest gateway. The main contractor is McLaughlin & Harvey of Northern Ireland, with PT McWilliams the main subcontractor. Dredging is underway with the vessels Loch Foyle and Argus. Shore based operations are constructing rock bund jetties following ground condition survey work by Glovers. "I am pleased to be able to see real progress on and off site. Stena Line’s £200m investment in the new port, with two new vessels on the route, is safeguarding 500 jobs in the operation of the port and creating around 900 new jobs in construction, a welcome boost to the local economy. The new port will allow fuel efficient crossings between Scotland and Northern Ireland and help enable the regeneration of Stranraer as a marine leisure area." “We are right on schedule for the proposed opening of the new port facility in autumn 2011. We have faced a number of challenges to date but are confident that we have been able to address most of the major structural demands associated with developing a new port and are now bang on schedule to deliver Scotland’s first National Project on time and on budget." The new port will provide Stena Line with the opportunity to offer its customers shorter journey times between Scotland and Northern Ireland helping to drive the level of tourism and freight business between both countries. In addition, the new facility will also provide environmental benefits in the form of reduced CO2 emissions from shorter sailings between Loch Ryan Port and Belfast Port. In addition to developments at the new port location, work is also progressing on the road infrastructure to and from the new port, primarily passing improvements on both the A75 and A77. The road upgrade work has been schedule to finish ahead of the opening of the new port to optimise traffic management when the port is fully operational. "Scotland has the toughest climate change legislation anywhere in the world and our ambitious climate change delivery plan means persuading motorists to get out of their cars and use more sustainable forms of transport. A consultation to consider the introduction of decriminalised enforcement of bus lane offences by cameras is now underway. Following a request from Glasgow, Edinburgh and Aberdeen councils, the Scottish Government has agreed to consult on the extension of powers to local authorities, currently operating decriminalised parking enforcement, to enforce bus lane offences by camera. These new powers, which would be in addition to current police enforcement, would allow local authorities to better manage the flow of public transport and improve the quality of bus services in their areas. “The Scottish Government is committed to improving public transport to help more people make the switch from private car to more sustainable, greener modes of transport. The consultation is open to all members of the public who may be affected by the scheme and can be accessed online www.scotland.gov.uk/consultations or can be requested from Iain Gardiner, Bus, Road Safety and Local Roads Policy Division, Area 2-F, Scottish Government, Victoria Quay, Edinburgh, EH6 6QQ.